A single anterior restoration is one of the most difficult procedures in dentistry to pull off. Restoring Susan’s fractured tooth with composite allowed us to conservatively achieve a natural result, mimicking the unique characteristics, translucency, and morphology of her natural dentition. Capturing these details of nature and transferring them to composite is possible because of the high strength and polishability of nanofilled composites. We are thrilled with Susan’s result! 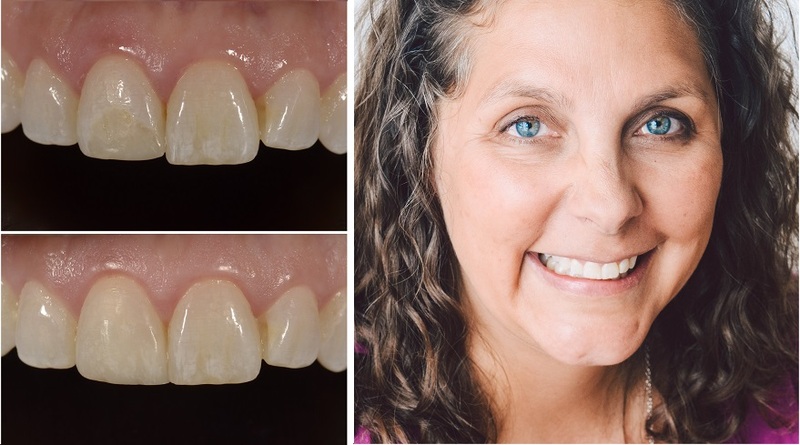 What makes Susan’s new composite filling different than her old one? 1. Shade– The most obvious quality that you might notice is the difference in shade between the old and new restoration. The old material was too dark and gray. 2. Translucency– While there aren’t any “translucent” areas on this tooth, using different translucencies of composites (4 to be exact) allows light to transfer through the material in a natural way. More opaque layers are used to mask the transition between the tooth and restoration, while more translucent layers are used to replicate the appearance of surface enamel. 3. Characterization– You’ll notice that Susan’s natural teeth have some really beautiful white stippling that wasn’t present in the old restoration. Using special tints and paint brushes (literally! ), we were able to replicate those natural white spots in the restoration. 4. Surface texture– Paying attention to surface texture allowed us to replicate where the light reflects off the restoration in order to mimic the adjacent tooth. 5. Polish- Newer nanofilled composites not only have the strength of traditional composite material, but small enough particles within the material so that we can achieve a beautiful surface polish.